Took me long enough didn't it? LOL. Recently while playing one of the old mario games, I fell in love with Toadette and just HAD to make her. Well I couldn't just make her, without making Toad too... so here they are. I left the color choices open in the pattern, because there is a rather extensive 'toad' family of characters that can be made with the basic head/body in this pattern... so the colors are up to you. You should probably read through the whole pattern before starting, simply because there are a few different parts to make and it's easier if you have an idea of the whole thing before you start. I tried to make it as easy to follow as possible. Dolls made with materials and hook listed measure approx. 9 inches high. Notes: The two dolls in this pattern are the same in the basic body, so there is only one pattern for that, the different parts such as vests, braids, etc are included. If you are interested in the rest of the toad family, the basic head/body pattern here is the same for them, just make the extra features you need (mustache and cane for Toadsworth, etc). You can make the entire group from the basic head/body pattern. When sewing pieces together, I recommend using a matching sewing thread and needle, rather than yarn. This helps to reduce unwanted and unnecessary bulk that may cause the doll to be misshapen. Yarn is perfectly fine if you prefer that, but if you can, opt for the sewing thread. Gauge isn't important, as long as your hook and yarn choices result in a fairly tight stitch so that the stuffing won't show through. Hook and yarn choice will determine finished size of the dolls. F/O. Stuff firmly and shape while stuffing. Do not close off open end. F/O and secure and weave yarn. F/O and stuff body firmly Don't close open end. F/O and VERY lightly stuff. F/O main color, attach gold. 3 sc in corner sc, sc evenly around entire 'vest', putting 3 sc in each corner. F/O weave in ends. Begin stuffing FIRMLY, be sure to shape into ball as you stuff. F/O and finish stuffing firmly and shaping. Weave tail through final round and pull to close. Secure end and weave in. Stuff Firmly and shape as you stuff. Weave tail through final round and pull to close. Weave in ends. Using yarn needle (or other sharp, large eyed needle) and long length of matching yarn, go through center of large 'ball', then through center of two of the small balls keeping them as centered as possible. Leave length of yarn free at top of 'braid' to attach to head later. Sew three spots on the largest ball of each braid (as shown) evenly spaced. I recommend pinning all pieces together before sewing to ensure that you have them in the placement you like. Remove pins as you sew to prevent the pieces from moving around too much during sewing process. Sew head securely to neck. Sew arms to sides as shown. Feet are sewn to the bottom of the body. I recommend cutting eye pieces from paper first and pinning to the face to check for size and shape before cutting from felt. Use the paper pieces as patterns for cutting. Two long ovals in black felt with tiny circles of white for 'catch lights' positioned as shown. Embroider remaining facial features as shown. Toad, Toadette and Mario Brothers are copyright Nintendo. omg well worth the wait, I can't wait to make these. I have been talking like crazy about wanting these as patterns. Thank you so much. I just adore all your crochet fan art! Thanks (again) for sharing such wonderful patterns! WOW-these are awesome! I just love your patterns. Thanks again for sharing, I'll be linking. Do you make up these patterns!? Also, do you sew the felt eyes on or glue them on? Yes, these are all my patterns, I make the dolls and write down the patterns as I go along so that I can share them. As for the eyes, I do both. I use glue to hold them in place temporarily, and then sew them down to make it permanent. Your stitching is so straight and even! I think my stitching is still just too loose. These are my favorite patterns for plushie dolls! These are amazing. If I knew how to crochet, I'd absolutely make them for my sons :O( Interested in a custom order??? We'd like a custom Toadette. I could send UPS or FedEx to your home to arrange for delivery. Are you interested? We want the Toadette with two eyes, not the "wink." Here a fan from the Netherlands. I love your designs and the patterns are very clear, so they are easy to follow for me. I discovered Amigurumi a few months ago. My daughter (12) is a fan of Toad so I began looking for a Toad pattern, but I only found patterns on the internet that where not really resembling Toad. Then I found your mushroom and made it for my daughter. A few weeks later I came back to your blog and to my big surprise I saw this lovely Toad you have designed. I showed it to my daughter and she said: wow, that one I really like. Now I am making this lovely Toad for her. I have a question about the yarn you use. Do you have a favourite brand of yarn for your work and which brand did you use for this Toad? I use Catania, but unfortunately they do not have a tan colour. could you make a pattern for yoshi?? he is my favorite...so cute! once again, thank you so much for a great pattern. toad is so cute! you are absolutely incredible, and your patterns bring joy to my family. cheers to you and yours this holiday season! aloha from hawaii. J'ai crocheté Toad selon vos explications pour ma fille. Elle est ravie et le trouve très ressemblant. Merci pour ce modèle... et les autres que je n'ai pas encore réalisé. Je ne sais pas comment vous envoyer la photo. Hey Linda! Thank you so much for this great pattern. I'm currently working on two Toads and a Toadette for my nephews and niece and blogging about my experience(my first amigurumi pattern) here: http://biggirljewelry.blogspot.com/. Of course, I HAVE linked to your blog and this pattern because you most certainly deserve full credit for all your hard work. Hey Linda! Thanks for the visit and the comment. I posted a reply there, but I think at least part of it is worth repeating here: Cotton yarn most definitely will not have the stretch or the memory of acrylic and therefore will be a bit more difficult to work with. For a less experienced crocheter, I would most definitely recommend working with the Red Heart acrylic yarn for so many reasons, but mostly because it's forgiving. Incidentally, I have an afghan my mother made for me about 20 years ago. (She used Red Heart then!) It's still in good shape in spite of many washings. 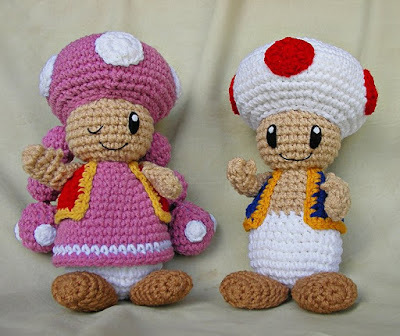 I finished the two Toads I was making yesterday and Toadette this morning. They look really good (if I do say so myself). While I was working on them, whenever I needed a break, I worked on a couple of other stuffies that I made using acrylic yarn. Acrylic slides on itself easier, so it's easier to work with; it's not so tough on my hands. Because acrylic has more loft than cotton, it doesn't have a gap between stiches when it's stuffed tightly. All in all, I will use cotton for certain ami projects in the future, but I'm more likely to choose acrylic. Thanks again for your patterns and for commenting on my blog. I love your creations and I will probably be making a lot of them soon!!! This is a great pattern! I stumbled upon it looking for something to make for a friend's birthday and I knew I had to give it a try. I'm pretty much done with it (I think it looks pretty nice) but being my first amigurumi project, I'm not sure how to embroider the smile. I was wondering if I could just using sewing thread and needle for or if it was necessary to go out and buy embroidery needles and floss. Thanks for the help and the awesome pattern! Look me up on Zook! A: No, I'm not a man. Bah, your patterns are so great! I've already picked several projects from your blog, starting with your Mario section. :D I'm making a Toad for my husband, and I'm tossing in a few changes, like bigger spots...that's beside the point, though. :P I've looked up video after video on the magic ring, and I've done it correctly according to all the videos I've seen...how in the world do you make yours without leaving a hole in the middle? Your mushroom cap spots are perfect! When you're pulling your yarn to close up the circle, when you get as tight as you think you can go, give it an extra strong pull (pull straight, not up). You'll feel and hear it 'squeak' as it tugs up firmly. Once you tighten it that tight, it's very unlikely to come undone and closes the hole up as much as will be possible. Love your patterns! You don't have a Mario bros. Yoshi pattern do you? Your patterns are amazing. Do you by any chance have a pattern for snoopy and woodstock? Hi! Your patterns are amazing! thank you for all of these! i have made about ten of your patterns for my 3 little brothers and their friends and they all love them! you are a life saver, without you i would actually have to BUY x-mas presents LOL^^ i thought that you might think it was cool that a 15 yo was using your patterns and my mom said that i should leave a comment. i was also wondering if you could try for a Vulpix pattern? if you did i would actually make that one for me. my brothers wouldnt lay a hand on it! well, thanks again and keep up the amazing work! Ergggggggg !! I am so new to crochet i just cant find a pattern for me in this blog what do you suggest? Your mario patterns are awesome. i made the mushroom a couple of years ago for a friend, but now My boy is into Mario and this morning I remembered your site! Thank you! Thank you! Hi- I'm having trouble sewing toad's head to the mushroom top. The head falls right in, can you help with this? Thanks! Wow; you are so incredibly talented. Ik vind je patronen geweldig. Mijn kleinzoon is de gelukkigste van de wereld. Have you made a princess peach or princess daisy? I'd also like to see a King Bowser or one of the ghost face badguys? I can't imagine what it takes to create these crochet patterns. You have a special gift and a very loving heart to share your patterns. Your patterns are the best online and you freely share them. You will truly receive many blessings. I made your Luma and she came out great. Im so excited to try more of your patterns. Thank you and God Bless!! I've got a problem with the head and mushroom cap. The finished cap is a lot bigger so that the head falls right in. Head round has 18sc and hat has got 32sc on the last rounds.Is this correct? Photo shows the hat fits snuggly on the head. Should there be another decrease row on the hat? Sue, once you stuff and start sewing, it will work out. I had the same problem until I stuffed and sewed!